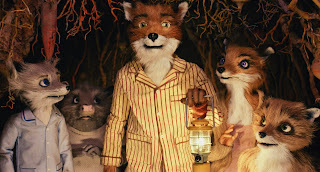 At first it may seem like an odd choice for Wes Anderson, to pick an obscure Roald Dahl story to adapt using archaic stop motion animation techniques, however, it only takes sitting through the first fifteen minutes of the "Fantastic Mr. Fox" movie to realize that it fits perfectly with everything else that Wes Anderson has done to date. 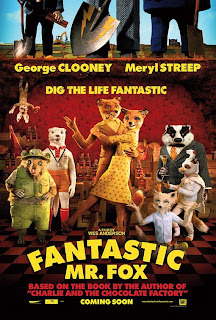 Structurally the "Fantastic Mr. Fox" is similar to all of Anderson's previous films such as "The Life Aquatic with Steve Zissou" or "The Royal Tenenbaums", with the conflict revolving around a charismatic yet eccentric family member whose passion leads the larger clan on an ill-advised course of off kilter crazy adventure. In this case, this role is filled by the dashing Mr. Fox properly voiced by George Clooney whose "Ocean's 11" chatty charm is a perfect match for Mr. Fox's ambitions and his smooth delivery compels his animal cohorts along. Thankfully Meryl Streep's worrisome voice blends into the background as Mrs. Fox, while the rest of Wes Anderson's regular ensemble stands out. The usual roll call includes a recognizable Bill Murray, Jason Schwartzman and Owen Wilson as assorted furry friends and family. On the villain's side, the all-star lineup continues with a southern sounding William Dafoe delivering the creepy lines of the security Rat, but its Michael Gambon's performance as the obsessed human hard-cider farmer who is hell bent on destroying the foxes, that really keeps the pulse of the story alive. Of course the choice to use stop motion animation makes this yet another feature film this year that celebrates this painstakingly practiced craft. Having seen an example of the school room set on display at a theater in Los Angeles I can say no detail was spared even for the scene that appears only moments on screen. 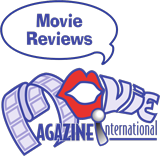 The extreme long shots, particularly those of the family tunneling are full of rich appeal, and the low-fi cellophane smoke and fire effects fill the frames with a kind of folksy fun found missing in a lot of computer animated fare. After riding off the rails with the hugely disappointing "Darjeeling Limited", it's good to see Wes Anderson back on track again with the "Fantastic Mr. Fox". Perhaps it's because Anderson decided to pair himself up with his old writing partner the notable Noah Baumbach, who has written and directed such films as the "Squid and the Whale" and "Margot at the Wedding", as well as collaborating with Anderson on the "Life Aquatic", but whatever the reason, this blend of talent works well together and makes for a great movie experience. Whereas the "Darjeeling Limited" seemed like a self-indulgent vacation that went nowhere, the "Fantastic Mr. Fox" takes all the elements we've come to love in a Wes Anderson production and serves it up in enchanting animated way, which is destined to become a Thanksgiving holiday favorite. Looking forward to digging up the original Roald Dahl story the "Fantastic Mr. Fox" is based on, for Movie Magazine this is Purple.